First off, a huge thank you goes out Jim Guthrie and Brian Dewitt from Car Crafters and Guthrie Racing for making this weekend a possibility for me, without the support from the team (including borrowing a truck and trailer) I wouldn't be able to do any of these events, so thank you from the bottom of my heart! 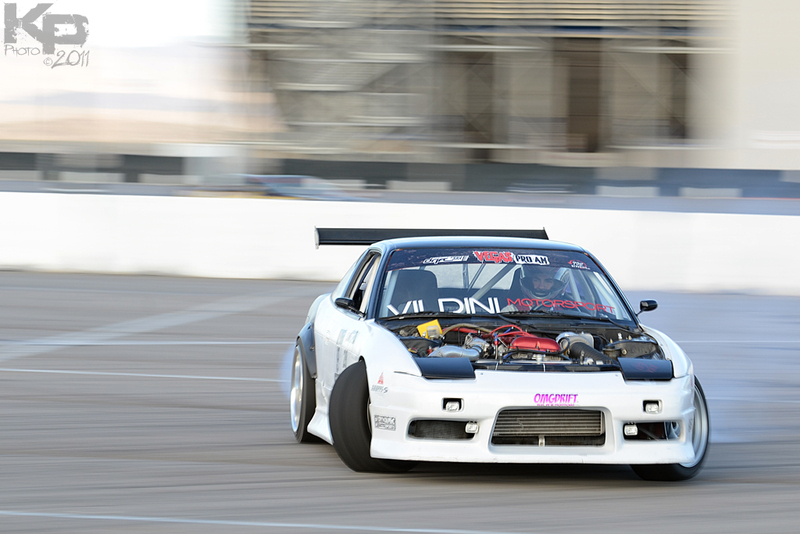 Now, on to the weekend put on by Nick Dizon and all the crew at VegasDrift! We left albuquerque almost 3 hours later than planned and didn't arrive at the hotel until 1:30am, so we did what any right minded person would do. We went out, drank and got crazy until 5am, only then deciding that sleep might be a good idea for the day ahead. Peeling ourselves out of bed at 11am the next day wasn't much fun having gone to bed just a few hours ealier, but we were all excited for the days slidey wagon competition. We headed out to a gas station to fill up on 100 octane (<3 you for that Vegas), and blasted down the hiway to Las Vegas Motor Speedway. We grabbed a quick bite to eat and set up camp in the pits. 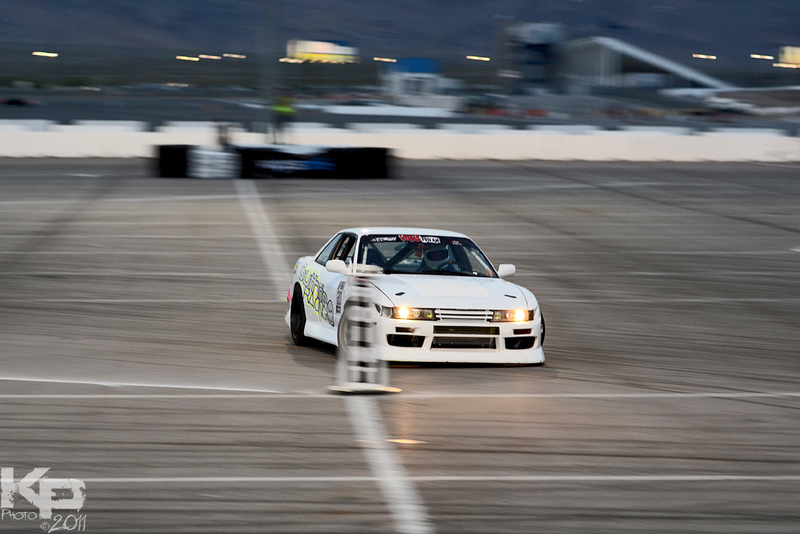 Random filler snap from Kyle Pope, at some point during my qualifying run. 3rd gear entry, outside near the wall, aiming for the tires surrounding one of the light poles, then heading out towards the wall for the first outer clip. 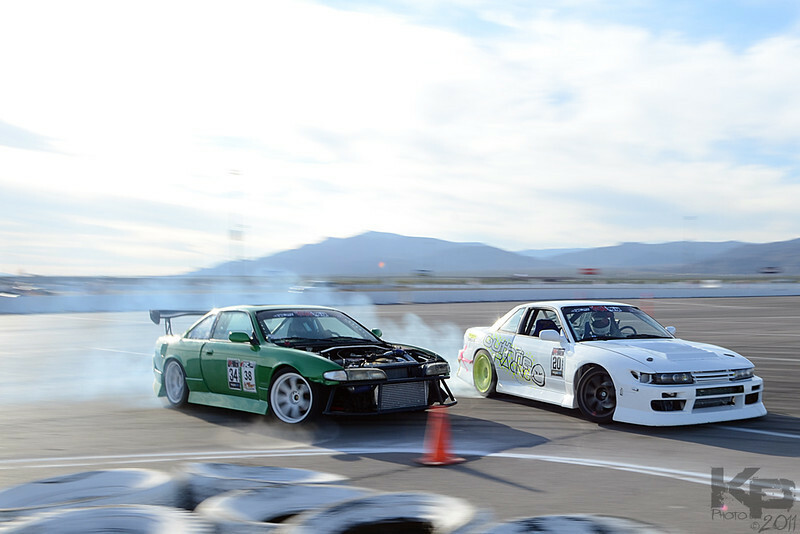 If you were wide enough, you would transition right before the next front clip, slowing the car down almost to a stop to complete a full 360 degree donut around another light pole, staying as inside as possible. It was back on the throttle after that to another outside clip on the wall, to another outside clip on the wall, then out to finish. Sadly the course had its way with more than a few drivers, and sent some cars home (I somehow managed not to hit any walls this time Brian). I think there were 3 bad wrecks and a few more fender benders over the course of practice. I laid down a pretty crappy first run, and i'll leave it at that (my camera didn't record anything past practice, so sadly I dont have any vids of the good stuff). 2nd run and I had a decent line, nothing super aggressive, decently close to the walls. I hit the clips and stayed inside on the donut section. A run that would get me qualified 11th out of the 32 registered drivers. Super stoked to make the show!!!! I lol'd when Nick announced my name. I think a total of 4 people clapped, and Mix yelled hooray! I followed first and have to admit, did a horrible job of doing so. For the first time that I can remember, I yanked my ebrake without pushing the clutch in, stalling the car out, then dumping the clutch to get it started again. Needless to say, it was not my best driving, but it was awesome practice. Alex had a super clean run so I really needed to step things up. I got the win due to the spin, and moved on to my first ever great 8!! I was set to follow for my first run, and straightened a few times and got all around beat up lol. My lead run was decent until i decided it would be a good idea to swing wide enough around the donut to get passed on the inside cleanly by Mauricio, sealing my fate and ending my run for the podium. Congrats to him for battling his way to 3rd place! I took my place back in the pits, stoked to have been able to drive with such rad people and watched the rest of the guys absolutely destroy the course. Congrats again to the top 4! All in all another epic event, met some great new people and got to drive with some of the best drivers in the southwest.